These high-grade, injection molded plastic watering cans feature a superior design with a lifetime guarantee. Color may vary according to stock availability. Our 5 liter watering can features an extra long spout. The rain-like water pattern arches upward and softly falls upon plants. This gentle sprinkle is unequaled for applying fertilizer to foliage. Comes standard with large plastic rose. 1 1/3 gallon capacity. Designed for and used by professional growers for over 100 years. Now manufactured from 1/8 injection molded plastic so they won't rust, leak or corrode. Perfectly balanced for indoor and outdoor use. Comes standard with large plastic rose.1 3/4 gallon capacity. Holds over 2 gallons and is engineered for years of use. This size does not come standard with plastic rose. A detachable angle spout ensures that your plants receive water where you want it. Perfect for Interior Plantscape professionals. 2 1/2 gallon capacity. This is a large and very sturdy watering can. Easy to pour from. Love it. 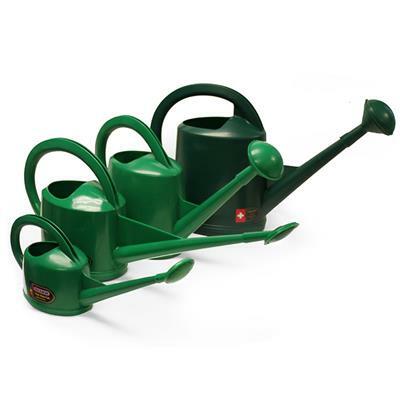 For a few years now I have been searching for a watering can that would release water gently - not disturbing soil, seedlings or newly planted seeds. I bought the Bloem Easy-Pour Watering Can and was happy for a very short time-the spouts on both cans I bought broke rather easily. The Dramm, however, is made of much sturdier plastic and the spouts on both the small & large cans produce a gentle rainfall that does not disrupt my delicate plants. Exactly what I need. I am very pleased with the design and material of the rose. It can be used on my old high quality water cans. This product should last many years. Love the 1.5 L watering can. Holds a good amount of water, yet is still a manageable weight when full. It is well balanced and the handle is well placed for both carrying and watering. The long spout makes getting to distant plants a breeze and the rose tip creates a gentle flow over delicate plants. Really a terrific tool. I have a larger Dramm watering can that I use regularly and love, but my 2 and 3 year old grandsons like to help water my plants and it was too big and heavy for them. I bought two smaller ones and they love them. They are sturdy, easy to use and the boys love helping me. I purchased a replacement Rose Spout for the 10 litre watering can. I must say those items are built like a tank. They will last a lifetime. Excellent products.This is my go to company for my gardening supplies. They have the best prices and great shipping rates. Yes. I will continue to do business with this company. Fits perfectly and looks great. You at the garden megastore were very helpful. This size can is best for watering beds of plants in the ground. It is well balanced and easy to carry. Because of the design of the rose, the water covers a large area.However, if you are watering small to medium sized pots, I recommend the 5-liter Dramm watering cam. The water will go where it is targeted and not all over the foliage & the surrounding area. I use this device to haul water and apply it where hoses are not available. I have two of the largest ones so that I am balanced when carrying the load. These containers are well made. The handles are comfortable carrying a load for a distance. The rose head supplies a perfectly soft stream which is ideal for seedlings. The nozzle slides on and off easily and stays in place while in use. Mine sit in the sun a lot and never get soft or melt. Whatever size you might be considering, this is a good product. I would highly recommend it. I got the 1.3 gallon and it is made well. I like the long spout on it. I find I don't bend over as much with it helping my back. It is a lot bigger than you realize so keep that in mind even though it is only a 1.3 gal. We have used these watering cans before and like the quality and balance of their construction. We are Senior Citizens and can carry them filled very easy. I have two different sizes. Both are well balanced and dispense the water gently. Good quality plastic too. These plastic cans are NOT MADE WITH FOOD-GRADE plastic.So if you're growing organic fruits and vegetables, you're taking the chance of harmful chemicals leaching-out into the water, and being fed to you plants.And of course, eventually being fed to you, when you harvest what you've grown.I asked this question, but this company didn't even post that info in this sites 'questions asked' section...when they got the answer for me from Dramm.THAT'S SHOCKING..! It is very good to water seedlings. We use this Watering Cans since many Years heavy . Solid and well balanced . This watering can is perfect for watering roses. It has a long spout that reaches under the bushes. No getting pricked by the thorns. Very sturdy and handy, happy with the purchase, should last for years. LOVE this watering can...the best one I have ever used...!!!!!!!! This is a wonderful large watering can! Just keep in mind, it will fade if left out in the sun, and it just might be chewed on if your dog is so inclined. Take care of it and it will last a long, long time! It is nice to find a well made can in a larger size. I bought 2, & I just hope they will still be available when I need another. Great size. Made out of sturdy material. But buy buy. We bought this just for the seedling that we started indoors. Wanted something very gentle flowing to not disturb the seedlings too much. We picked the smallest one (with the rose head) and it worked quite well for us. This is the best I could find and it is. Large but not to large, easy pour and fill. My hose end soaker fits in the opening!Very high $$. Both spouts should be included for that price! Really? Oh well, I broke down and got this can that should last a lifetime. It works great. Spreads water very gently over a large area. Sometimes to large an area. Why is this not included considering the high cost of the can? Nice watering can. Easy to reach small places. Good for petite size person like me. This has got to have the most gentle, yet full, spray going. It's all because of the round shape of the rose. I ordered two more 7L Dramms and I now have four of them. They are wonderful for transporting water around the yard, they are well balanced and easy to carry. The rose puts out a lot of water yet it gentle on the plants. I wish I had ordered this watering can long before I did. The gentle flow produced by the large plastic rose is perfect for watering in newly planted seeds. 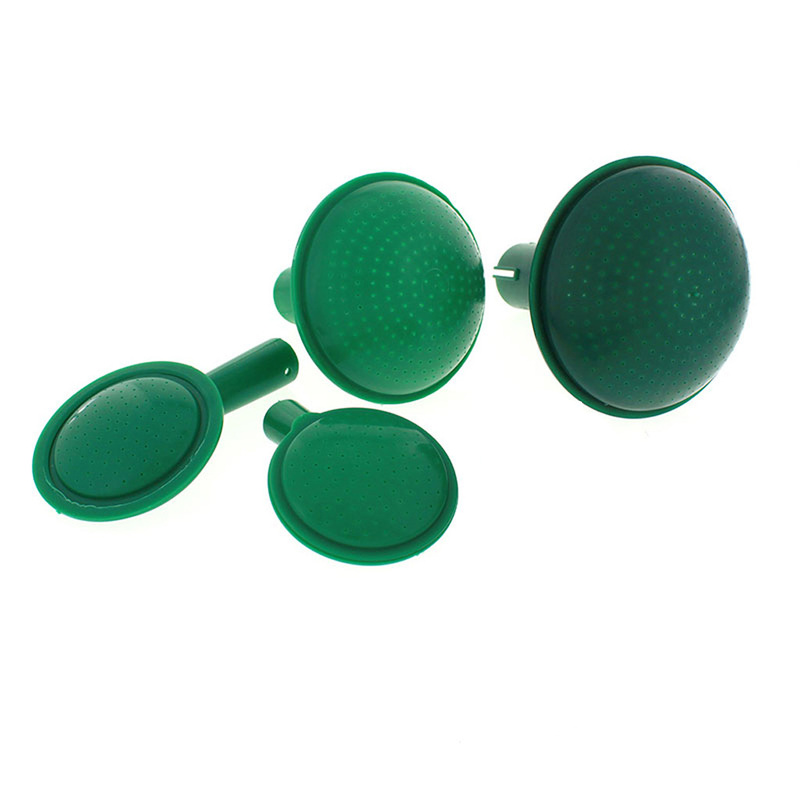 In addition, it provides versatility by allowing easy removal of the rose end for plants that do not the gentle flow. The extra long spot is another plus for hard to reach plants. It's just great! This can is perfect for watering hanging baskets because of the angle spout. Also, the large carrying capacity of the can (over 2 gallons) enables me to go longer without having to fill it up again. This water can is exactly what I needed. In the past when planting seeds, the water would wash them away. However, this can produces a fine gentle water flow in order not to wash away the seeds. It's also great for foliar feeding. Well worth the money! The gentle shower of the 5L is great for overhead watering and fertilization, and they're sturdiness and balance is much appreciated esp. when I use the 10L. 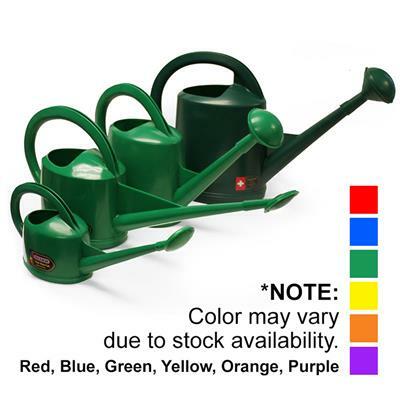 These watering cans are the best I've purchased, and without a doubt will last for many years. holds lots of water and has a spout that will help you reach thick foliage,sturdy.